Kings Arms, Fleggburgh01493 368333work Restaurant - EnglishThe Kings Arms, Fleggburgh, is a beautiful country pub and restaurant in the heart of the Norfolk countryside. Relax and enjoy our wide range of cask-mark ales, ciders, cocktails and wines in front of our log burner or enjoy fine dining in our restaurant. A finalist in "Pub of the Year" for 2016, The Kings Arms has some stunning country walks round the common, perfect for a stroll with the dog. In the colder months, warm up with a hot drink in front of the roaring log burner or enjoy the sunshine in the garden area. 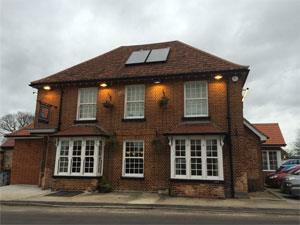 The Kings Arms, Fleggburgh, is a beautiful country pub and restaurant in the heart of the Norfolk countryside. Relax and enjoy our wide range of cask-mark ales, ciders, cocktails and wines in front of our log burner or enjoy fine dining in our restaurant. Our open kitchen serves locally produced food from 12pm to 9pm by local "Norfolk Chef of the Year", Mark Dixon. A'la carte menu available as well as bar meals and Sunday lunch. Functions also catered for. Dietary requirements can be met, please call ahead to advise. Take the A149 from Great Yarmouth signposted towards Filby. Proceed straight through Filby towards Fleggburgh on the Main Road and follow the road around, past Fleggburgh Recreation Ground until you reach the junction with Town Road on the right. The Kings Arms is located on the corner.